If you’re thinking about having a residential fence installed on your property, it’s important to be aware of who to work with, how to keep it in good repair, and how to keep it looking great. First, you should work with an experienced residential fence installation company. These professionals can help install all different types of fences (electric gates, PVC fencing, wood, etc.) on landscapes of all shapes and sizes. 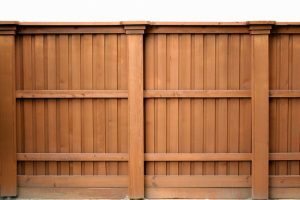 Wood is the most popular style of fencing and can look great as long as you’re staying on top of its maintenance and cleanliness. Apply a wooden fence cleaner — Your first step to keeping your fence clean should be applying a quality fence cleaner. Start from the bottom of the fence to the top, casting the entire fence with the cleaning product. In order to get the cleaning solutions behind tight and difficult-to-reach areas, dip a brush into the solution and apply it between all the fence boards. Let the cleaner sit for 15 to 20 minutes. Rinse the fence with a pressure washer — Next, you should use a quality spray washer to rinse the cleaner off the fence. Be sure to avoid letting the pressure washer remain in one place in order to avoid damaging the wood. Let the fence dry afterward for at least 24 hours. Use glue for minor damage repair — For small splits and cracks on your fence, using a waterproof wood glue can help secure it for 24 hours as the glue dries. After a day, you should remove the tape and inspect the area for any further damage. Tighten loose fence boards — If any screws or nails seem loose, you should remove them and then replace them with stainless steel screws. It’s best to use caulk to fill in the holes and keep the screws in place. Select the right wood staining product — Most experts recommend staining your wooden fence at least once every two or three years. Make sure you’re picking a wood stain that matches your fence — or at least the color you desire. If your fence is red, for instance, red chestnut staining product is a great option to ensure the best look. Roll the stain on — It’s best to use a roller to coat the fence with your desired wood stain. It’s recommended to work with the wood grain and not against in order to keep the color even and looking great. If you want to learn more about how to properly care for your home’s fence or have a brand new one installed, give Durham Fence and Guardrail a call right away!